Today, I want to talk about the value of a network marketing business. This is my opinion, based on what I have experienced and learned during the past 17-years in this great industry. Keep in mind, I am not an attorney, CPA or financial advisor, so please do your own due diligence. The primary purpose of building ANY type of business is to create an asset that you can one day SELL for a large profit. That’s the goal of most entrepreneurs. Work hard for a five to fifteen years and then cash out and live your dreams! Another common goal is to build a business that does not need YOU to run it and keep it going. Basically, you build a business with a system, and the system runs the business without you, all while you enjoy the profits. 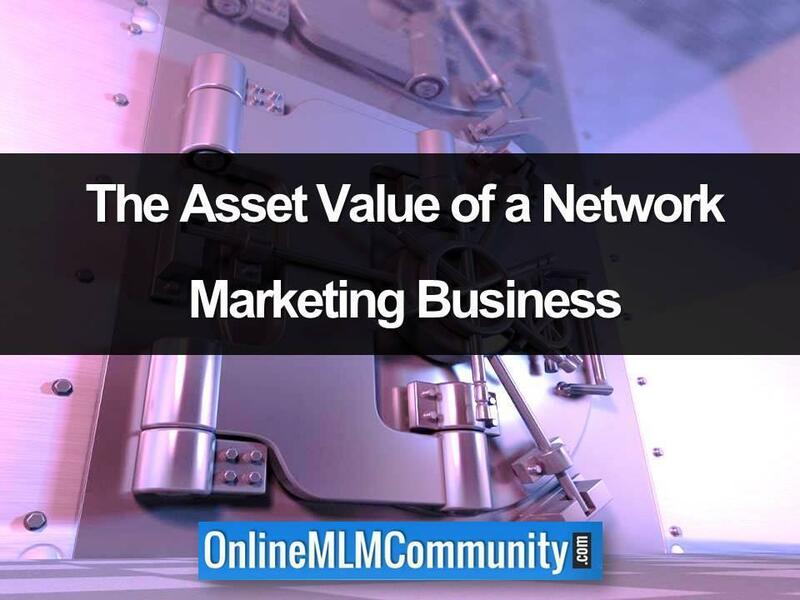 A network marketing business is an asset. I define an asset as anything that produces positive cash flow. I know one thing. In today’s world, most people do NOT save enough money for retirement. Most people are loaded with personal debt, have minimal retirement savings and are just one or two paydays away from being financially destitute. It’s a sad reality. Smart people INVEST for the future, so they own assets that produce ongoing income before and during retirement. Basically, you save/invest a lot of money during your working years and live off the interest when you retire. That is the plan, although most people never achieve this. Here are a few examples of how much money you might need to save to create a solid cash flow during your retirement years. To create $500 per month in cash flow ($6,000 per year), you would need $200,000 saved and earning you a 3% yearly interest rate. To create $1,000 per month in cash flow ($12,000 per year), you would need $400,000 saved and earning you a 3% yearly interest rate. To create 2,500 per month in cash flow ($30,000 per year), you would need $1 million saved and earning you a 3% yearly interest rate. To create $5,000 per month in cash flow ($60,000 per year), you would need $2 million saved and earning you a 3% yearly interest rate. To create $10,000 per month in cash flow ($120,000 per year), you would need $4 million saved and earning you a 3% yearly interest rate. The truth is most people will never save this amount of money during their lifetime, to have a consistent residual cash flow when they do retire. Most people will never save $200,000 let alone $4 million. That’s why most people spend their Golden Years struggling to survive. Even worse, finding a stable, consistent interest rate above 3% isn’t all that common. Yes, it’s possible. But, most investment returns fluctuate year-to-year and come with different levels of risk. Network marketing is a business. That means there is NO guarantee of success. You might hit a home run, you might strike out. Most people strike out. But, you do have the POSSIBILITY to change your financial future with network marketing. That is what I love about it. It’s a level playing field for anyone who will commit, work hard, and stay the course. With network marketing, it won’t take you a lifetime to generate a $500 to $10,000 monthly residual income. Well, it could take you that long if you don’t work your business. But, if you treat your business seriously, I personally believe you could create a very significant residual income within a few short years. Of course, individual results will vary. Even if it took you five years to create a $5k monthly cash flow in your network marketing business, it would be worth it. Heck, it would be a great deal. How much would an extra $5k per month help you in your retirement years? Most retirees live on far less than this. Going back to the example listed above, you would need $2 million saved, earning you a 3% yearly interest rate, to give you the same amount of cash flow ($5k per month). 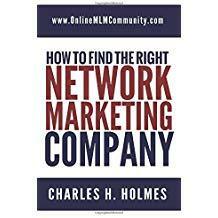 I have watched many people sell their network marketing business. What I have discovered is that most people received one to three times their yearly income. For example, if their network marketing business produced $5k monthly ($60,000 per year), they could normally sell their business for $60,000 to $180,000. The price range will vary based upon many of the trends listed above. Of course, you can ASK for a much higher selling price, but just like real estate, you don’t always get your asking price. Sometimes you get less and sometimes you get more. For most people, if your network marketing income is stable, and doesn’t require a lot of time to maintain, it doesn’t make a lot of economic sense to SELL your business. Instead, let it run on auto-pilot and just enjoy the residual income as long as you can. While most people in the MLM Industry only talk about the big money, I’m here to tell you that you could build SUBSTANTIAL wealth by earning an extra $500 to $1,000 per month with your business. If you were smart with that extra money, you could buy additional assets, such as real estate, to create additional income streams. Or, you could just invest that extra $500 per month into your retirement account. What if all you ever did was earn an extra $500 per month for 20-years in the industry and used ALL of that income to buy assets? You would retire a wealthy person. I think so anyway. Combine that with the tax advantages of owning your own home-based business, and it is a true win-win proposition. At the end of the day, only you can decide what is best for you. It might be network marketing. It might be something else. Even if you decide NOT to do network marketing, I hope you will take the time to create some type of business (or asset) that can build you a residual income and monthly cash flow. I believe EVERYONE needs residual income. There you have it folks. 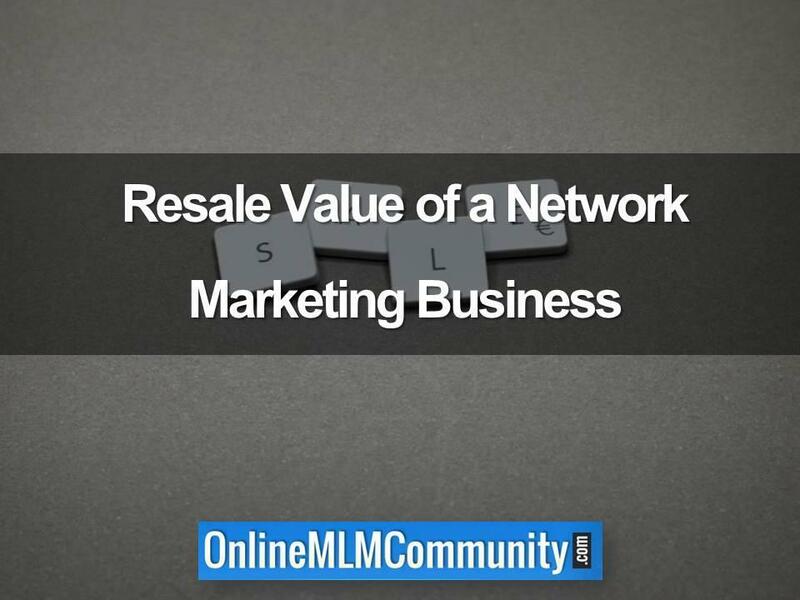 This is what you need to know about the value of a network marketing business. I hope you found the information helpful. Please leave a comment below to tell me what you think. As a quick disclaimer, I am not a CPA, financial advisor or lawyer. This article is just my opinion and is for educational purposes only. Please do your own due diligence and do what is best for you.